Compelling message from our around the World Astronauts warning the 2016 Climate Change Conference of a vanishing planet. Includes a moving message from Netherlands’ Astronaut Wubbo Ockels, Ph.D where he describes his love of the Earth and stating his beloved Earth has cancer. He recorded his statement the day before he died from cancer. Offering hope if we all work together we can save our planet. Doll’s Day or Girls’ Day. In Japan it is held every March 3rd. At Simpson our Festival is held the first full weekend of every March, this year March 4th and 5th. The Festival is open to the public and free of charge. Also on display are Bonsai (miniature plants and trees) Bonsai at Hina Matsuri Festival and Ikebana (flower arranging) Ikebana at Hina Matsuri Festival. Very welcome as we wait for spring to finally replace winter. The ladies prepare Bento Boxes for lunch each day which are extremely popular and are sold out quickly. Hope you can join us! 6001 Wolff Street in Arvada, Colorado (just off of Sheridan & 60th). Love Colorado Golf and Contributing to Charity? Join us at the beautiful Indian Tree Golf Course in Arvada, Colorado for a day of golfing and awesome scenery. And, best of all? Your participation will help us replace the furnace at Simpson United Methodist Church. Posted on March 8, 2016 Categories Colorado, Future Events, NewsTags Arvada, Colorado, Community, Denver, golf, sanseilife, Simpson United Methodist Church5 Comments on Love Colorado Golf and Contributing to Charity? The ladies have been busy cooking for the festival. Homemade manju, spam musubi and chicken teriyaki bento boxes each day while they last. Doll’s Day or Girls’ Day. In Japan it is held every March 3rd. At Simpson our Festival is held the first full weekend of every March, this year March 5th and 6th. 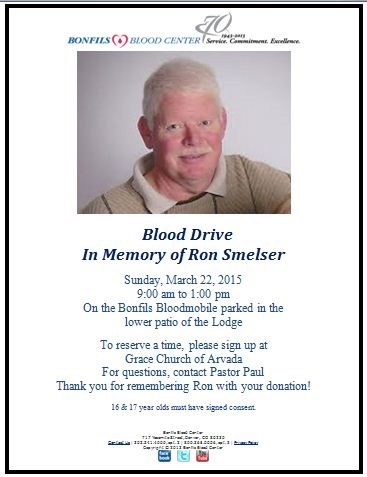 Ron Smelser understood the importance of donating blood. Blood donors saved his life over and over during his struggle with cancer. His wife Judy is on a mission to help others the way generous strangers helped Ron. Good luck Judy! I’ll see you on March 22nd!